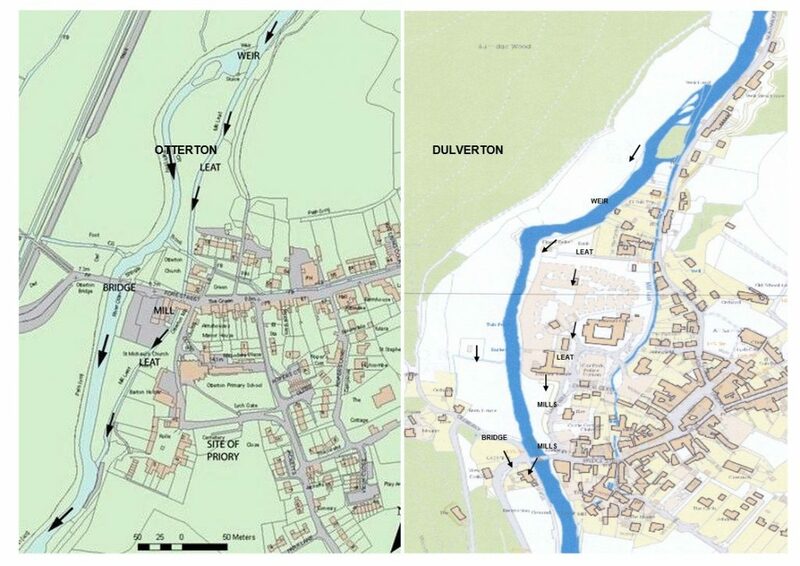 Further work is required to definitively identify when Dulverton’s Urban Watermill Landscape (the weir, leat & watermill system) was originally built, most experts believing it to have been constructed in the 11th or 12th centuries. Intriguingly the Dulverton system is not listed in the Domesday Book, but there is a system at Otterton in Devon which is listed. Its similaries with Dulverton are stunning and this would tend to support the current view of the age of the Dulverton system. The Urban Watermill System in Dulverton can, however, be traced back to 1331 when it was mentioned in a will. The system was in use right up to the 20th century. It gives clear indications of the town’s importance as an industrial centre and has implications for our understanding of the history of the town itself. In the middle ages waterpower was ‘cutting edge’ technology, giving vast gains in productivity over work previously done by horses and men (it was at this time the term ‘horsepower’ was first coined – waterwheels were referred to as having so much ‘horsepower’ i.e. the number of horses the waterwheel had replaced) . The historian Gimpel refers to ‘the medieval genius of inventiveness’ which led to the harnessing of waterpower all over Europe. Dulverton was part of this first (waterpower) industrial revolution, a massive weir was built (at Weirhead) and the leat was skillfully engineered to arrive at the top of Dulverton’s ‘mill quarter’ (from Town Mills to Lower Mill) to give a ‘fall’ of 6 metres which was capable of driving 6 watermills. In the Academic/Learning Resources section of this website you can find more details of the history and importance of this fantastic medieval heritage asset.